Preheat oven to 375 degrees. Lightly butter 6 one-cup ramekins and coat lightly with bread crumbs; set aside. Melt 3-1/2 Tbsp butter in a small non-aluminum saucepan over medium heat. Whisk in flour; cook for about 3 minutes, stirring often. Whisk in milk and increase heat to medium-high; bring mixture to a boil. Reduce heat to medium and continue cooking for about 3 minutes, stirring constantly. Remove from heat and transfer sauce to a medium mixing bowl. Whisk egg yolks, mustard and tarragon into sauce to combine. Stir in roasted peppers and two-thirds of the goat cheese until combined well; season to taste with salt & pepper. Set aside. In very clean copper or stainless steel bowl, whip the egg whites with a pinch of salt until they just hold a stiff peak. Fold ¼ of the egg whites into the cheese mixture until well mixed - this will lighten the cheese mixture. Gently fold in remaining egg whites, taking care not to over mix. 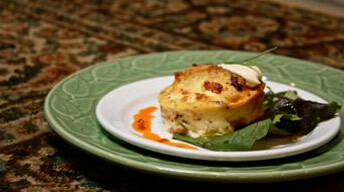 Divide soufflé mixture between prepared ramekins and top with the remaining goat cheese. Place ramekins in a roasting pan and place in oven on the center rack. Pour hot tap water in roasting pan to fill halfway up the sides of the ramekins. Bake about 20 minutes, until lightly browned, puffed up and fully set. Remove from oven and cool for two minutes -- the soufflés with fall slightly. Gently remove soufflés from ramekins, either with a large spatula or by tipping them upside down until they fall out. Place them upright on individual plates. Garnish plates with greens and drizzle with balsamic vinegar and olive oil. Serve warm.